We had a lovely surprise this morning when we read that Pixelated Cardboard named One Deck Dungeon their Game of the Year for 2018! This is one of the most immersive, agonizing, light game experiences we’ve come across. That’s a weird sentence, but bare with us. Immersive; you are dungeon crawling and leveling up your hero throughout, there’s a real sense of progression as you, um, progress through the dungeon and gain skills and generally improve your hero. Agonizing; fight or flight, which loot do you take, stay or descend? So many tough, tough choices that are absolutely vital to winning. Light; it’s a dice placement game and once you get the basic mechanics down the game breezes by in what feels like just a few minutes. Well, sometimes it actually is a few minutes as you meet a very quick death, but usually it’s closer to 20. Most of that is a testament to the game itself, but the important part is that Handelabra gave the great game an amazing implementation to match. To commemorate this honor, we’ve added a One Deck Dungeon: Game of the Year Bundle on Steam that lets you complete your collection at a discount! Unfortunately, the mobile stores don’t let us bundle things like this so you’ll just have to keep an eye out for the next sale (but you won’t have to wait too long). 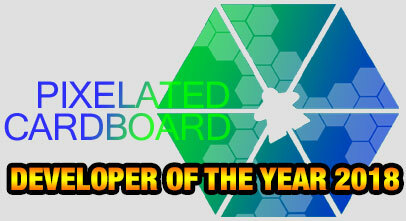 This alone is an honor, but Pixelated Cardboard went further and named us Developer of the Year! It is so great to be recognized in this way, and we promise to do even better in 2019. First, they made One Deck Dungeon following a successful Kickstarter in which they hit their time estimate goals with impressive accuracy. Next, they backed that up with loads of extra content, including an expansion that is roughly the same size as the base game itself. In their final One Deck Dungeon-related moment of the year, they sent out a detailed survey to gauge interest in a phone version of the game, which is currently tablet and Steam only. We don’t know if ODD will see phones, but it’s commendable that they are doing their due diligence there, not to mention their unwillingness to simply cram the tablet version onto phone screens. These folks want the best possible experience for users and that shows in their work. To top everything off, they ran the Aeon’s End Kickstarter last month and announced their next title after Aeon’s End would be Spirit Island which has been widely praised as one of the best, most unique co-ops in recent history. That’s a lot going on in one year and the best part is, we expect a carbon copy of it in 2019. Read about all the other games that were honored for 2018 over at Pixelated Cardboard.